Known as the “Cradle of Mankind,” the original Garden of Eden, and the place where, six million years ago, Millennium Man walked the Tugen Hills, Kenya is the ethnic homeland of us all. It was from Kenya’s nurturing embrace that the earliest humans wandered forth to colonize the world. Kenya later became the adopted home of more than seventy different groups of ethnic African migrants, each with its own distinctive cultural identy. It is a land of miraculously harmonious contrasts: tropical ice, teeming wilderness, vibrant culture, and gentle tolerance. A place where, despite the burdens of poverty, drought, and famine, the phrase Hakuna matata (“no problem”) embodies the national attitude, and a smile is the most valuable currency. Culture Smart! Kenya is not intended as a travel guide. It won’t tell you how to climb Mount Kenya or where to spot lions; but it will tell you how to make the most of your visit by interacting fully with the people. 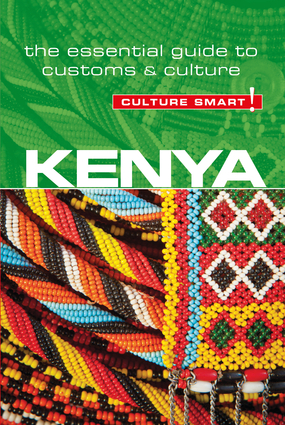 It describes many different aspects of Kenyan life, both private and public, from traditional African customs to modern business practices. By offering insights into people’s behaviour, values, and attitudes, it will prepare you for cultural differences and help you to respond with respect and understanding. A generally tactile people, Kenyans shake hands all the time and at every occasion; indeed it would be considered impolite on meeting someone not to shake hands, regardless of whether you had met them earlier, or had never seen them before in your life.